This may not be what most of you would consider “exciting”, but one of the most exciting things happened today. 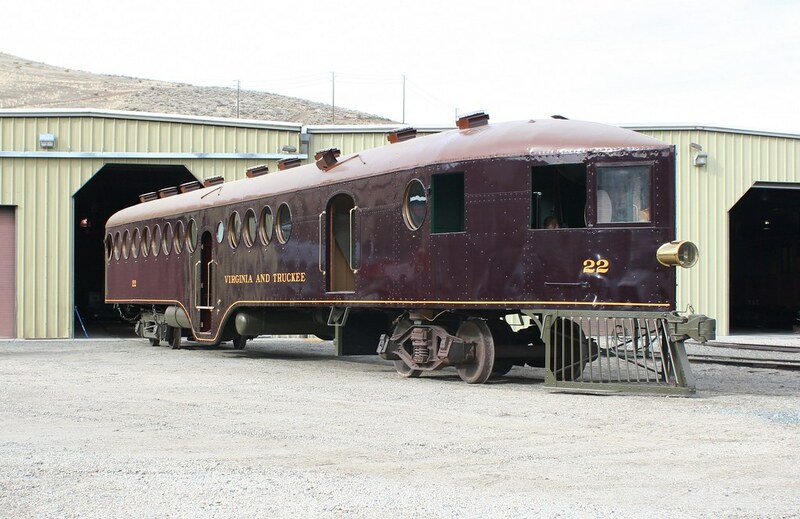 I was driving by the Railroad Museum in Carson City, and every time I do I peek over at the shops to see if there is any equipment sitting outside. usually it’s just their flatcars sitting out there, but sometimes they’ll pull out one of the engines or a passenger car, and I’m always curious to see what they have out. Just something to kill five seconds while I drive down the road. But today when I peeked over, I saw something I had never seen outside before, something that made my heart jump a little, and I swerved to get into the turn lane so I could pull into the museum’s parking lot. Because what they had pulled out today was none other than the McKeen Motor Car, when has been buried in the back reaches of the restoration shop undergoing a full rebuild for over 12 years now. 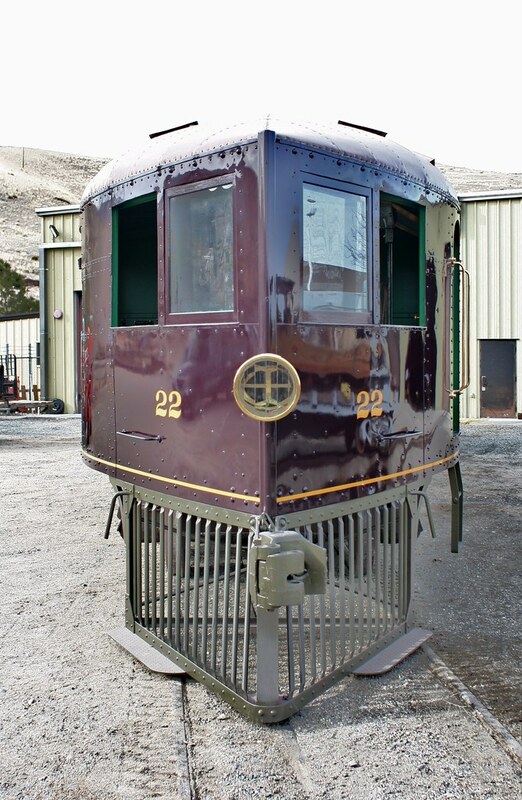 The McKeen car is one of the prize pieces of the Railroad Museum’s collection. 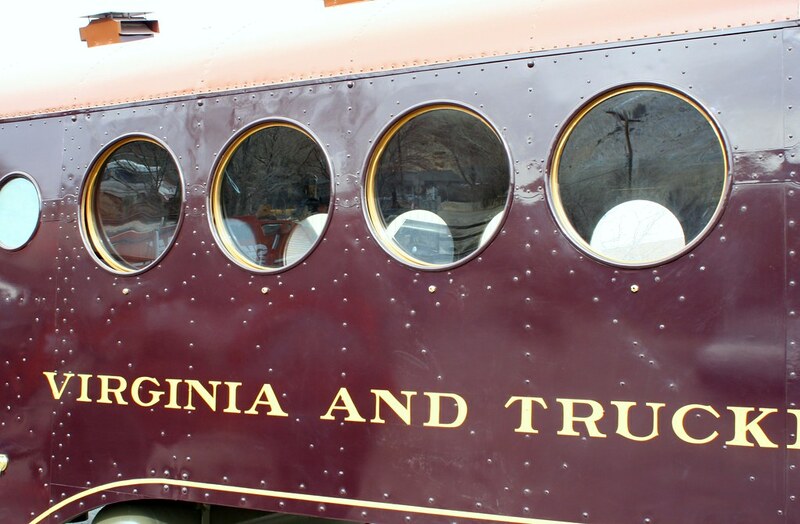 It was built in 1910 and ran on the V&T Railroad for around 35 years. After it was retired it was turned into a roadside diner, then incorporated as office space for a plumbing supply store. In 1996 it was donated to the railroad museum, and they have been working ever since on renovating it to full operating condition. All that time it’s been hidden away from public view in the shop, and work has been very slow as they’ve only been doing it as money allows. Of course, they’ve also been taking extra time on this renovation because they want to make sure it’s done just right, and also because they want to get it operating again. It’s not just going to sit around as a museum piece, it’s actually going to pull passengers around the museum’s circle track when it’s done. So they had to make sure it was not only beautiful but functional as well. Every time I’ve gone to the museum I’ve peeked through a grimy window in the corner, trying to get a glimpse of the car as it sat in the dark shop. But today, for whatever reason, they pulled it out to get some sun. Not that it actually saw the sun; today was completely overcast. But still the car got to be let outside to get a deep breath of fresh air, and because I was going by at the right time I got to take some pictures of it. And it is looking gorgeous. The outside paint job is completely done, a deep rich burgundy with gold lettering. The interior was roped off and looked like it still needed some detail work, but seemed to be plush and comfortable. 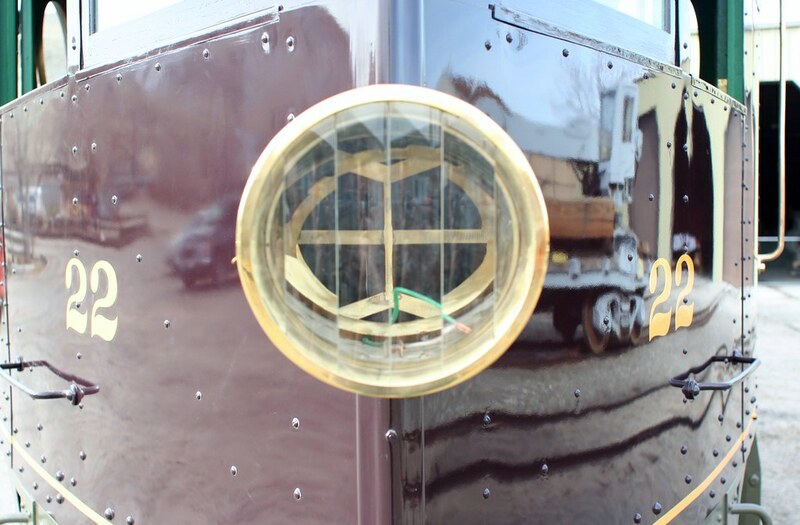 The light mounted directly in the middle of the windsplitter front end is different from historic pictures of the car from the 1930s, when it had a ungainly locomotive headlamp bolted to its roof. But the way they rebuilt it actually matches up better to the way it was when it was first delivered from the factory, 99 years ago. The V&T replaced the light at some point. It seems like the saga of the McKeen Car has been going on forever, and it is heartening to see the progress this far along. I think they have enough momentum to get it done very soon, and I’m not sure if they’re going to unveil it this year or wait until next year, 2010, the centennial year of the car. Whatever they do, it will be great to see it out there driving on the rails again, 65 years after being retired from service. Maybe it won’t be as exciting for visitors as riding behind a steam locomotive, but it should still be fun, and extra meaningful for everyone who knows the full story behind it. Kudos to the museum staff for an excellent job here. The group at Carson city are to be congratulated! Has the museum completed its resoration of No. 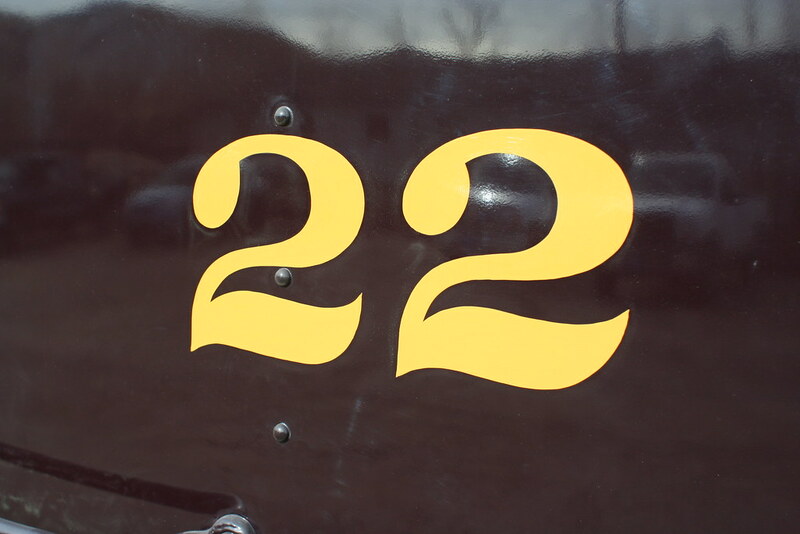 22 yet, and if they have, has a date been set for the unveiling? Correction to above The McKeens entered service in Victoria Australia on 13th May 1912. Curious. 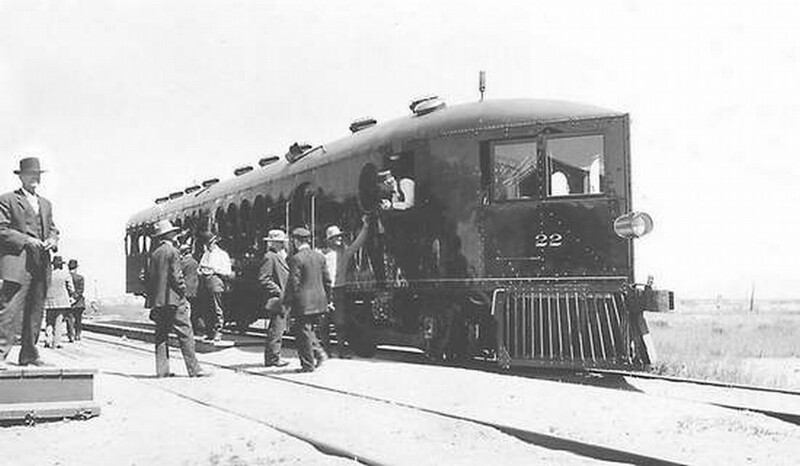 The historical photo shows the car to be a baggage – mail – coach yet it has been restored as a baggage – coach. 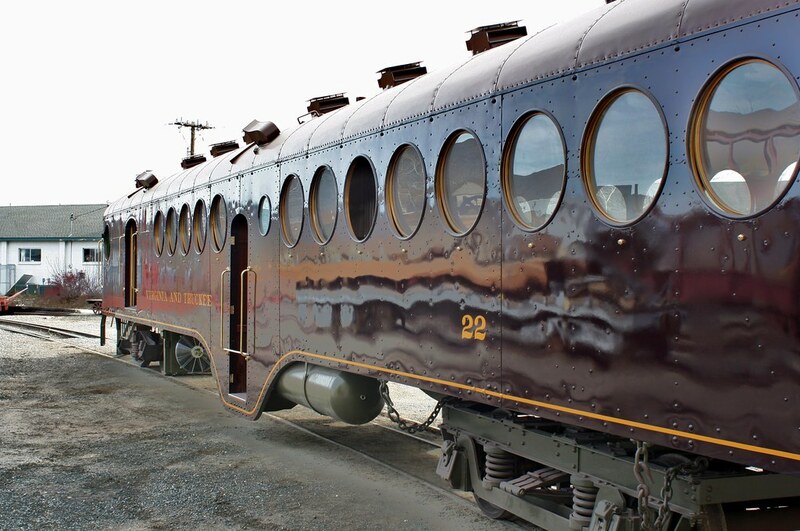 Was this car originally a baggage – coach and converted to carry mail or was this simply done by the museum. Thanks for the report. It is greatly appreciated!!! My son is purchasing an old house of which all the contents are to belong to him. LOTS of antiques and nostalgic items to be inventoried and researched. One item is a McKeen Gasoline Motorcar instruction book (#954) copyright 1912. We’re curious of the importance and possible value of this book that’s in excellent condition. The previous owner (who was a very good friend and recently passed away) worked for the railroad many years ago. Any information you can provide would be greatly appreciated. Thank You. P.S. I’m attempting to attach a photo to this email. Hope it works.